LtoR: President Bilton; Japan, Noriko Yokosawa; Germany, Renate Hiring; Brazil, Michael Zellner; UN Ladies, Marj Govett; United Kingdom, Beth Allen; UN Men, Josh Dulabaum; USA, Bob Jones Jr; Canada, Gina Bissillion; VP Hussmann. 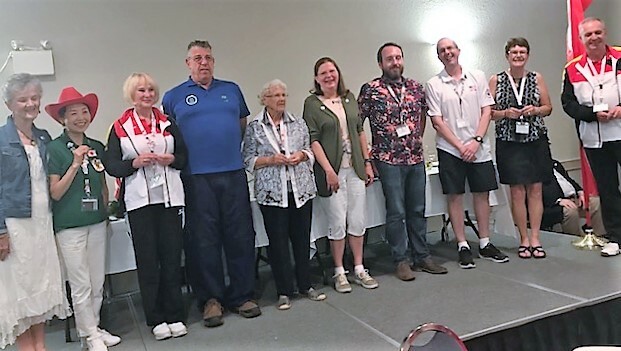 Muriel Burnett Speaks: Pictured above, with ISA President Myrna Bilton and Vice President Dieter Hussmann, are the participants who received the Merit Award Pins at High River, AB: Congratulations to everyone!! Stan Speaks: The Merit Award is a most respected symbol of interpersonal relations consistent with good sportsmanship at the International level. It is awarded to one player from each nation, a player who best demonstrates these attributes. Selection is the responsibility of the Team Captains in conjunction with their National President. The award was introduced by Jim Allen of Allen R Shuffleboard Co at the 25th ISA in Lakeside, OH in 2006 and has been carried on for every Team Event since. The Merit Award is one criterion applied for entrance into the ISA Hall of Fame, Player Division. I thought readers may appreciate reading the article I posted on the occasion of the First Merit Award Presentation in Lakeside OH, in 2006, the 25th ISA. Click: 1st MERIT AWARD Lakeside ON 2006 You may also wish to read the Policy regulating this Award: Copy of ISA President Policy Letter 2012-2 Merit Award and now you have “The Rest of the Story”!! lol Stan McCormack. 2018 08 06.